Garrett and I attended the GUNS OF AUGUST 2011 convention in Williamsburg, and had a pretty good time despite the mephitic stink wafting up from the Great Dismal Swamp, which was actually on fire at the time. The entire Virginia peninsula was blanketed by a pall of smoke. This did not deter convention attendance.. if anything it made people want to stay indoors in the air conditioning. 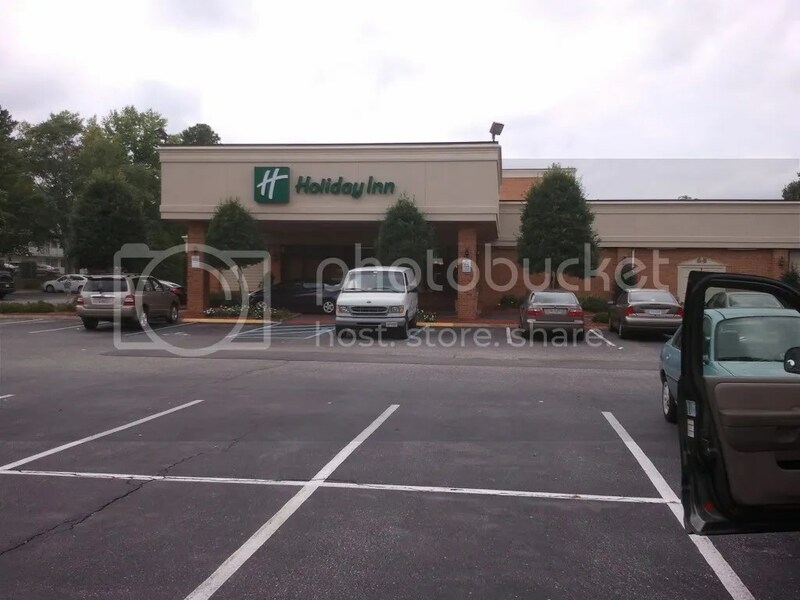 Williamsburg Holiday Inn site of Guns of August and Williamsburg Muster conventions. 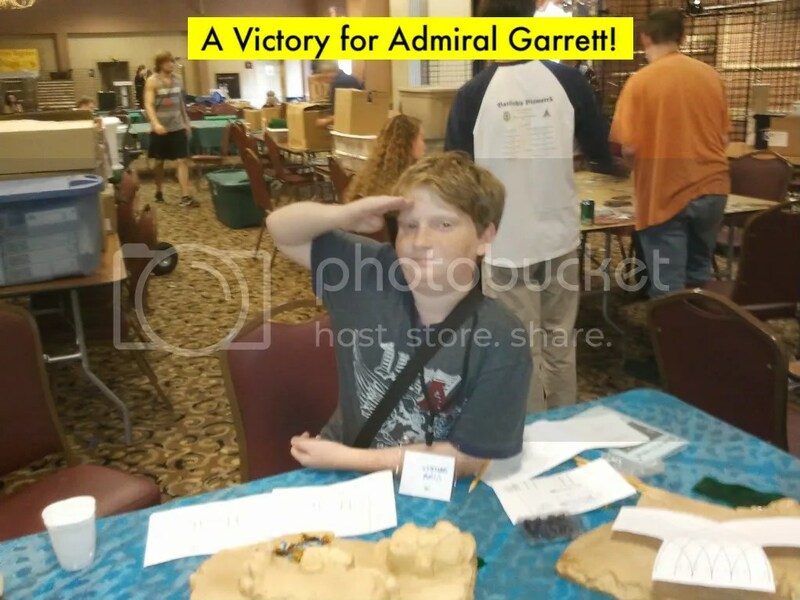 I really enjoyed the Muster (so did Garrett) and the GOA event proved to be a lot of fun as well. The only drawbacks about travel to Williamsburg was using Priceline. 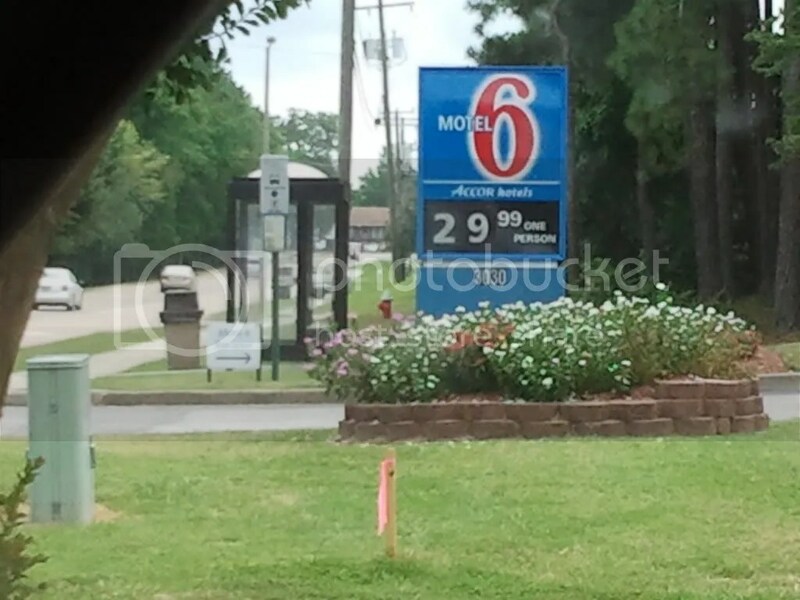 I got a decent rate at a Budget Hotel on Bypass Road (Rt 60). In retrospect I should have tried to walk in– hotels and motels are not my big deciding factor in choosing a convention. I spend very little time in a hotel room so I prefer cheap and decent to overpriced and close to the venue. Alas, the Budget strained my good nature– the staff was surly, the wake up call didn’t happen, the continental breakfast broke down an hour ahead of what the front desk had said the night before, and the room was generally grimy, and humid. It felt like a hotel room out of Barton Fink. Ironically there was a cheap spot right next door to the hotel the convention was being held in! Hmmm.. right next door, and it was about ten dollars less than what Priceline gave me. Oh well, you live and learn. Guns of August and Williamsburg Muster are run by the ODMS (Old Dominion Military Society), a local club that appears to be located in the mid Peninsula. They do an excellent job of running this convention and I applaud their efforts. Everyone I talked to was uniformly courteous, friendly and helpful. All this with volunteer help and a shoestring budget. Reminds me of the old NOVAGCON days. I miss those. Williamsburg is an excellent venue for a smaller convention like this– plenty for families to do, close to Richmond and the Tidewater area, tons of affordable hotels and restaurants surrounding the venue. I liked dropping in for the weekend, even if it took FOREVER to get there. Gar and I left at 8 AM and arrive at 12:45 PM. I can actually get to Lancaster PA faster. 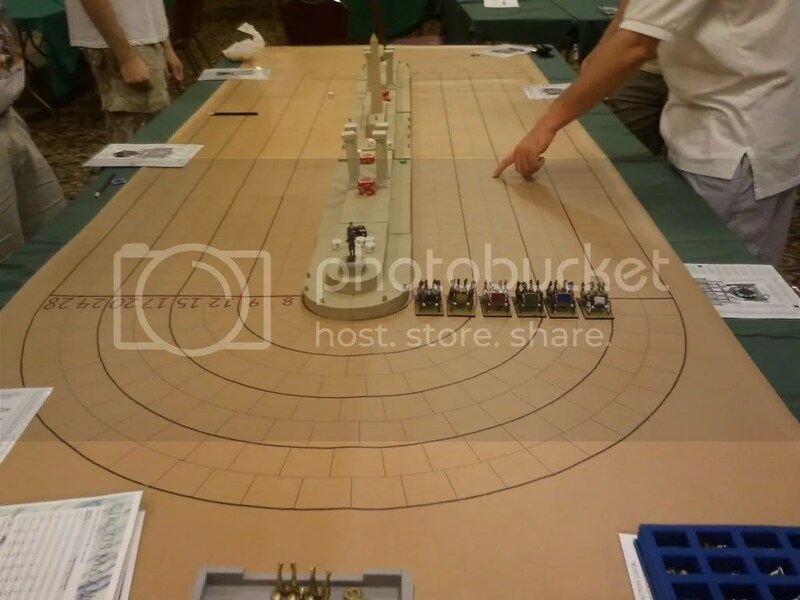 Dystopian Wars Demo. Gar loved it. The con itself is like a macrocosm of what I call the old TRIADCON/ATLANTICON model of providing a little bit of space for all kinds of gaming. 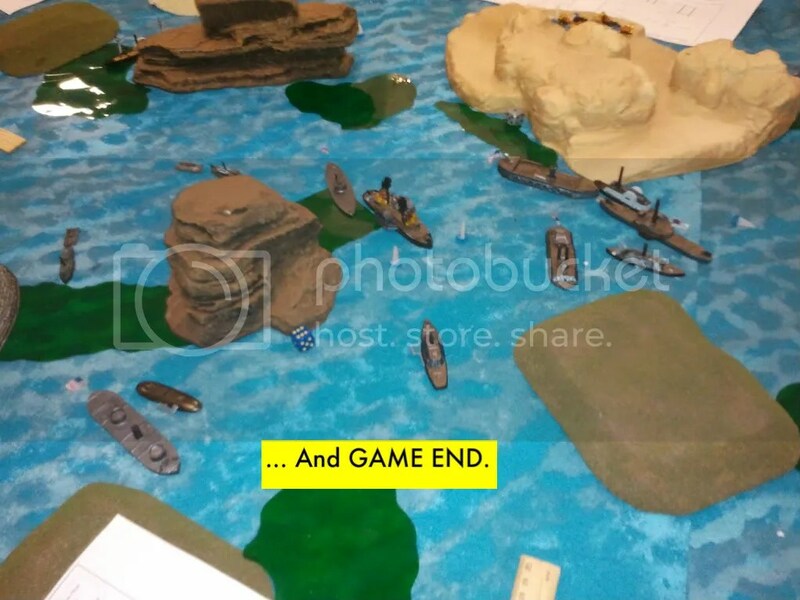 RPGs and boardgames (especially board wargames) were in evidence everywhere, as well as miniatures in the larger hall. I wish I had had more time to attend as I would have loved to have played some boardgames as well as miniatures games. 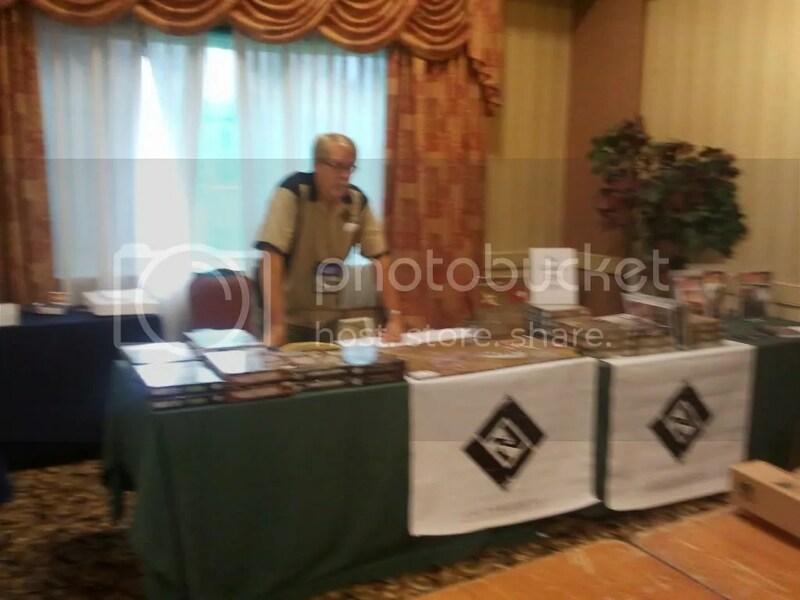 There was also a pretty good turnout of vendors. I ended up buying a new naval mat (I now have 3), The Lexington Timberclad, An Ellett Ram and a Casco Class Monitor models from Thoroughbred, The new version of Rules for the Common Man’s HAMMERIN’ IRON, some dice and assorted ephemera. So we did a little something for our local economies. Cool Chariot Game Sat. and Sun. 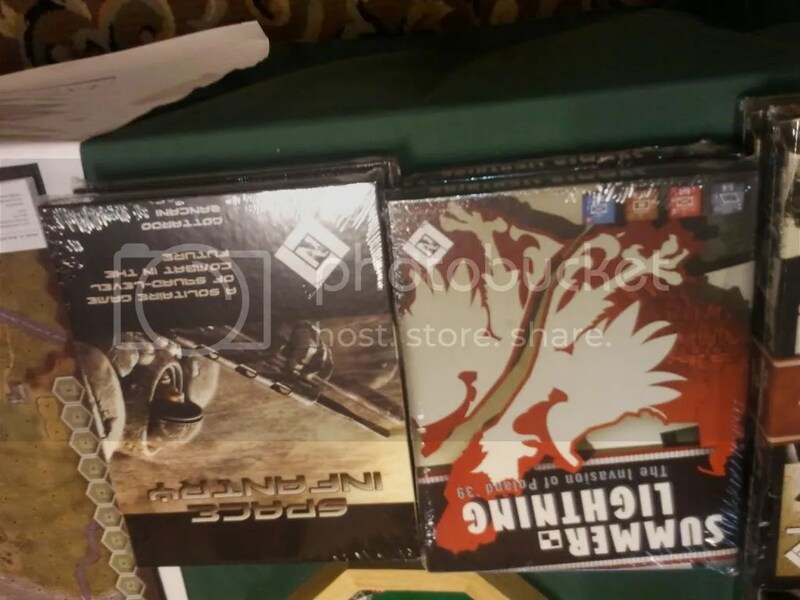 Mark Walker and Lock and Load Games were detected! On Saturday Gar was going to play Mechwarrior while I sat in on a full game of Peter Pig’s HAMMERIN’ IRON game, but ended up sitting in with me. Hammering Iron was demonstrated by the chaps from the RFCM crew (Martin Goddard, Andy Barnett, Ralph and Sam Ashdown) who were actually visiting the con to run demos all weekend (man, the pound must be doing very well against the dollar these days). That put a crimp in my plans to run an Ironclad game for Saturday night, so I moved it to Sunday morning. I’ll have more on HAMMERIN’ IRON in a follow on post. Suffice to say I thought highly of the new rules and bought a copy. I’m sure Larry at Brookhurst hobbies will appreciate my follow on business, as there is a lot of supporting material to purchase to make it happen. Kudos especially to Martin Goddard who is kind, patient and entirely professional about demoing games. I enjoyed playing in his event! We went and checked into the Budget, and drove back, stopping off at Friendlies for dinner– very enjoyable and affordable too. 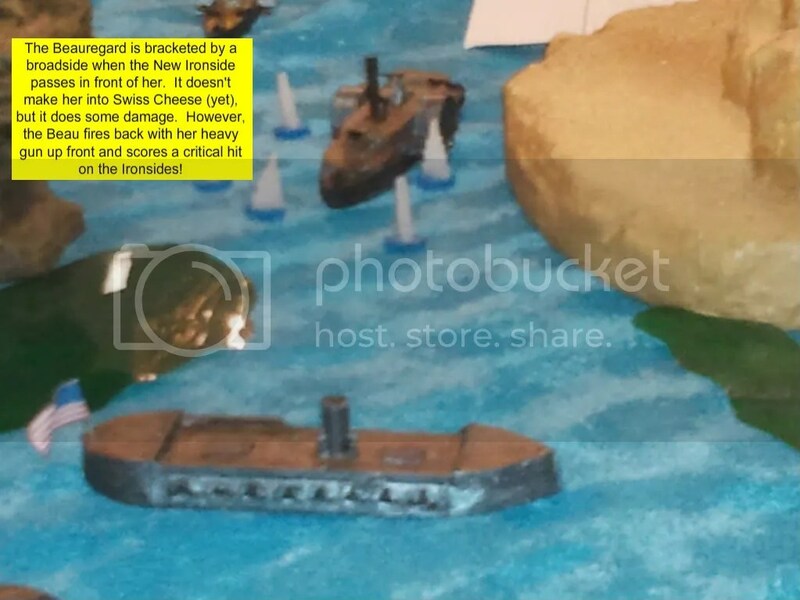 Having swapped our events– my intention was to run Ironclads on Saturday and Uncharted Seas on Sunday– I ran the Uncharted Seas game Saturday night. I’ll have more on this when Dewey LaRochelle, who sat in Saturday (as the victorious Iron Dwarves faction) sends me the photographs he took. We ended up heading back to the Budget Inn around 11 PM. We woke up later than I would have liked (not having brought an alarm clock, and the aforementioned wake-up call not being forthcoming). 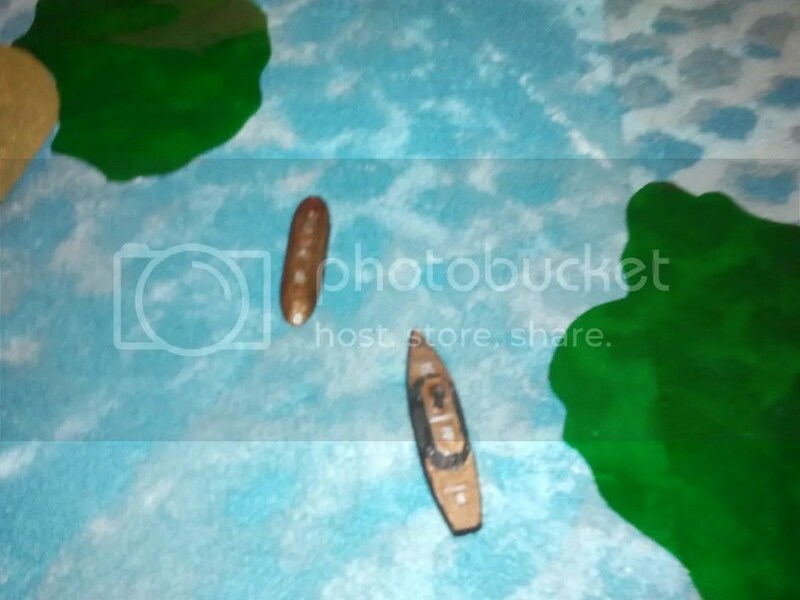 We set up Beer and Pretzels Ironclads, which was my first time running it anywhere. The Scenario was mostly ad-hoc, but I kind of wanted to have a situation where the Union Navy is ambushed by smaller Rebel forces along a route of march. This is what I set up. North is up on this map. The Union Fleet is moving on a Southern fort, probably near Charleston. The Fleet is threading its way through a narrow channel in the middle of some off shore islands in the hope of positioning two mortar rafts in a place where they can shell the Fort from an angle where the forts’ guns won’t be able to fire back. 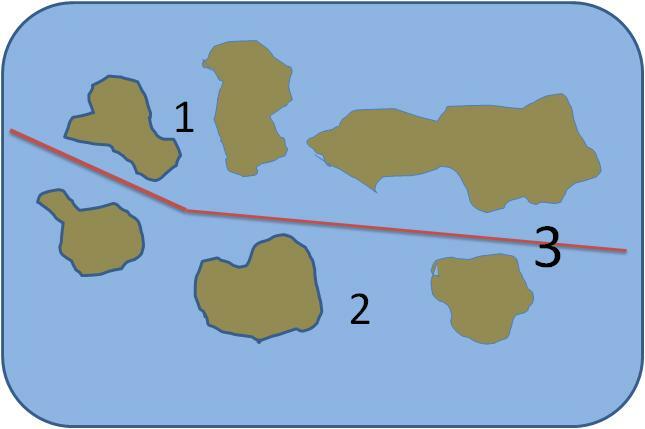 There is a narrow deep channel through some small islands just South of the Fort (which is off map), which theoretically should provide a masked approach to a good firing angle (see the red line W to E on the map, above). 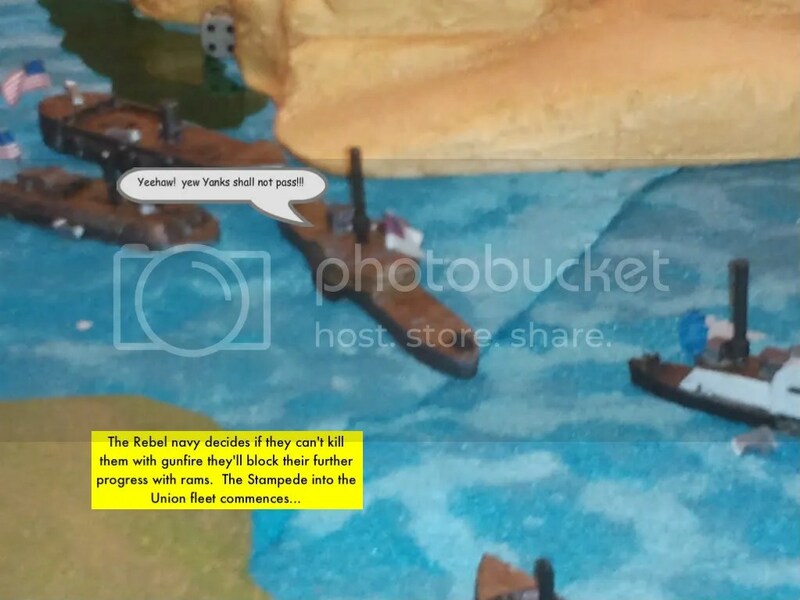 Unfortunately for the Union commander, the Rebs got wind of this scheme and have deployed a Confederate Fleet of rag-tag group of vessels of all sorts along the route of the Union Fleet, with the idea of ambushing them, or at least blocking their progress. 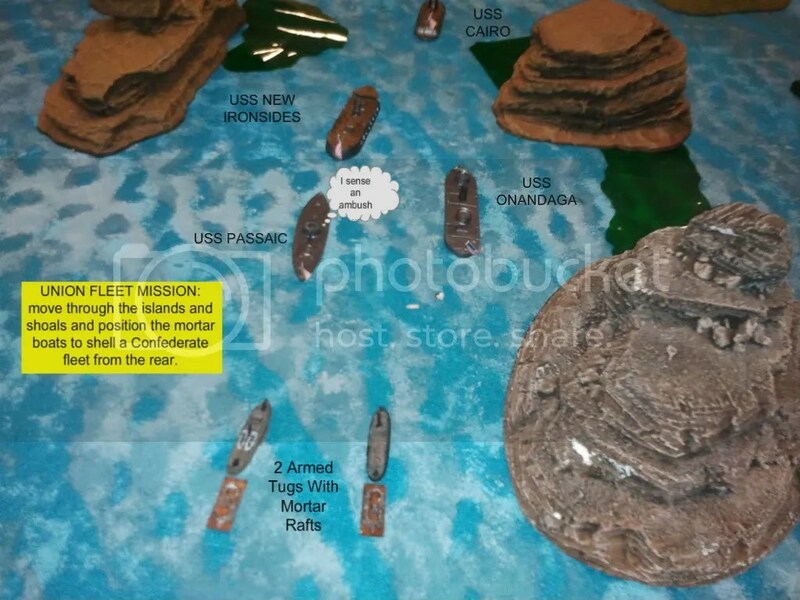 Union Forces: USS NEW IRONSIDES, USS CAIRO, USS PASSAIC, USS ONANDAGA, and two armed tugs towing a mortar raft each. 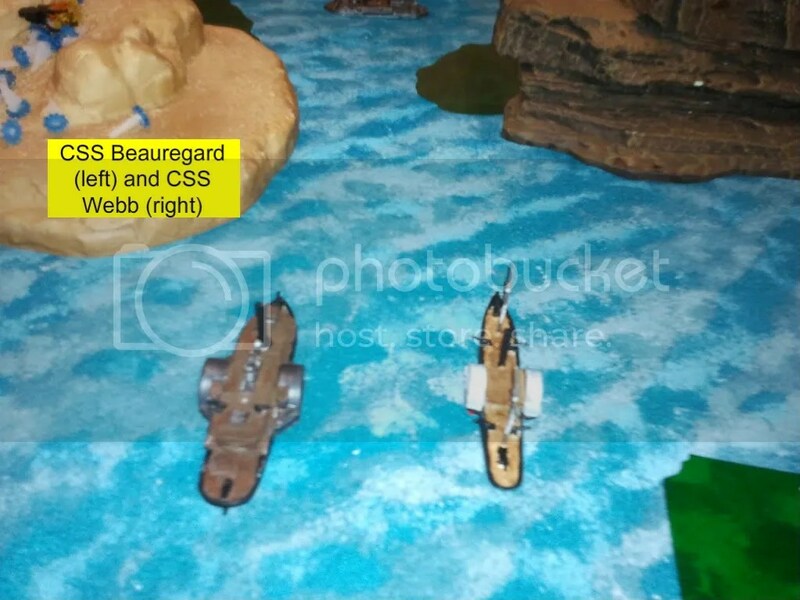 Confederate Forces: CSS BEAUREGARD and CSS WEBB, at Position 1 on the map. They will engage the Union fleet early, and as their life expectancy is low, try to scuttle themselves right in the fleet’s path if they get too badly shot up. CSS MANASSAS and CSS ABLEMARLE will take the far Southern flank on Position 2 on the map. They will fire from a distance and avoid direct engagement with the Yankees. 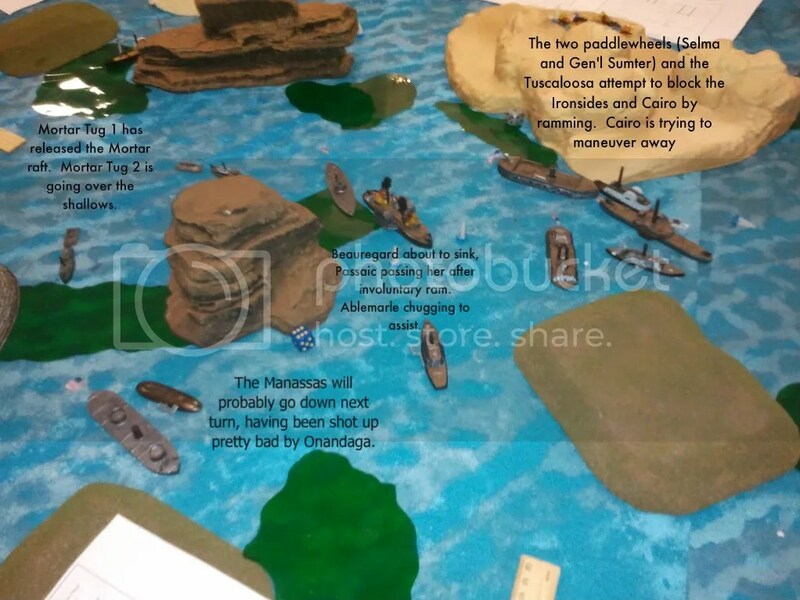 Lastly, CSS SELMA, CSS GENERAL SUMTER, and CSS TUSCALOOSA (Position 3) will try to deliver the knockout if they can, or block if they must. There were also two DAVID style submarines but we never got that far. From the get go, this would prove to be as unbalanced on the table as it would be in real history. Even giving the Rebs extra ships, the differences between ironclads and wooden paddlewheels would be to great to overcome. Herewith is an illustrated replay, with commentary in the yellow boxes. You may click on the image to expand it. The wary Union Fleet advances down their planned route (red line in map above). Manassas and Ablemarle in position 2. 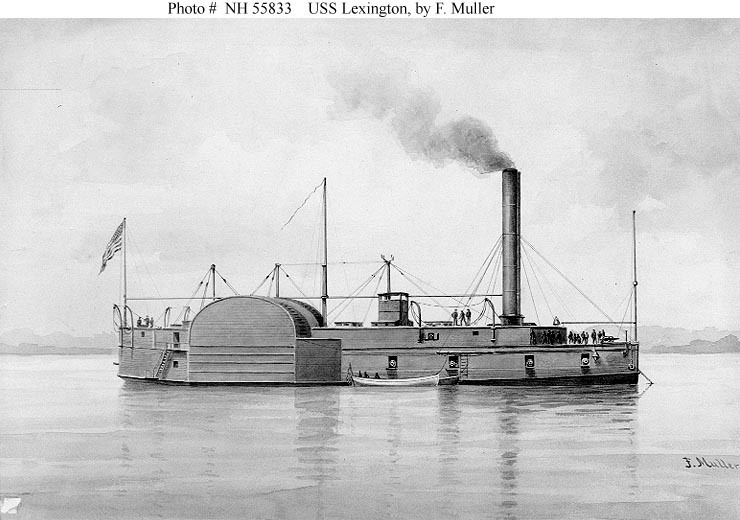 Position 1: The CSS Webb and CSS Beauregard. 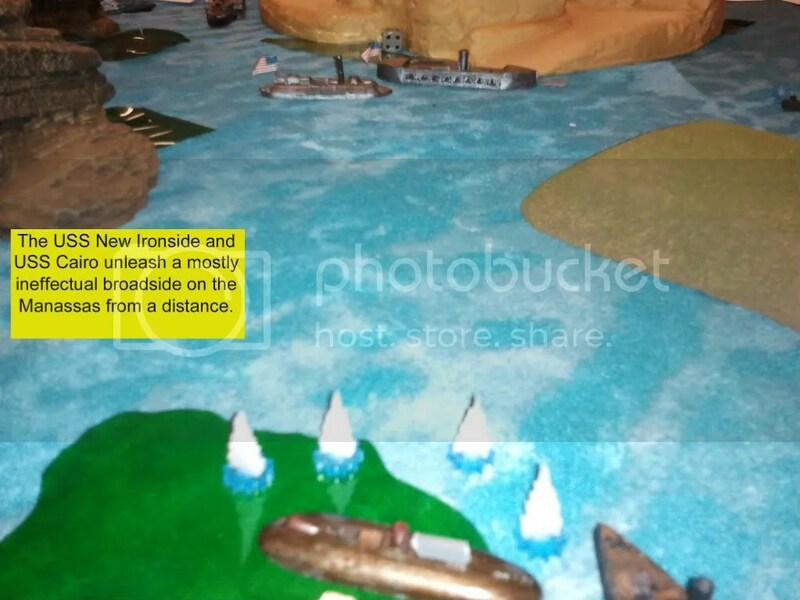 The 2 paddlers and Casemate on Position 3 go on the advance. The General Sumter was the first Confederate ship to be struck. She was soon riddled but they hung in there until end of game. (top to bottom, SUMTER, SELMA and TUSCALOOSA). The Ambush at position 1 occurs.. poorly. The Beauregard did not activate quickly enough and the Ironsides was in place to deliver a broadside that packed a lot of weight. 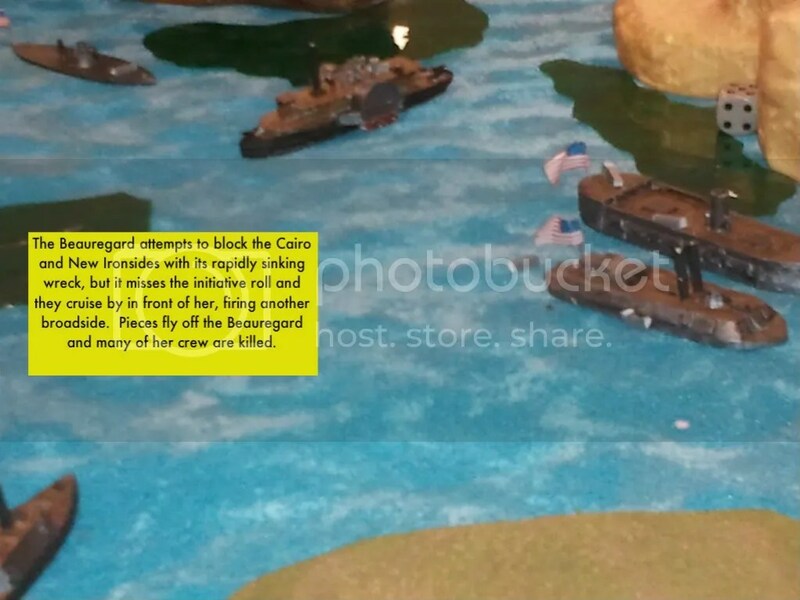 Being made of wood, the Beauregard was shot up pretty bad, losing a gun and a few crew. The Webb decided to move around to behind the Union fleet. MANASSAS and ABLEMARLE try to get steam up to jump into the brawl.. 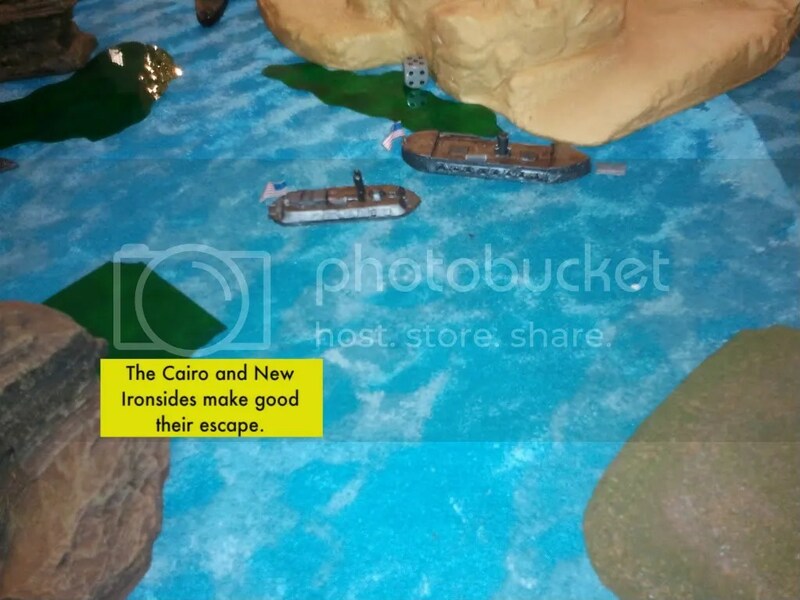 They are slowed somewhat by the shallows (the green colored film) and take a desultory fire from the CAIRO and NEW IRONSIDES. Meanwhile, ONANDAGA is moving obliquely South, trying to find a way around the collision ahead, and the mortar boats follow him. 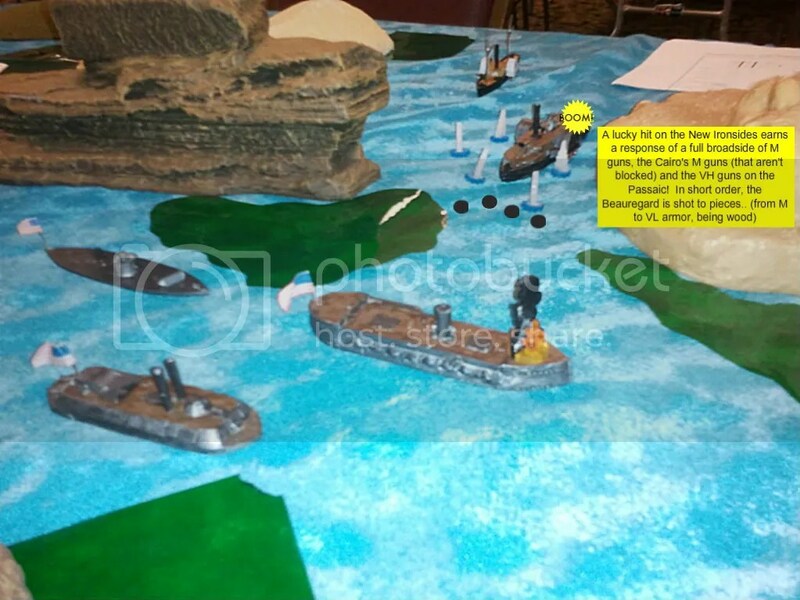 The BEAUREGARD may have lost some crew but manages to get off a lucky shot on the NEW IRONSIDES, which was a critical! 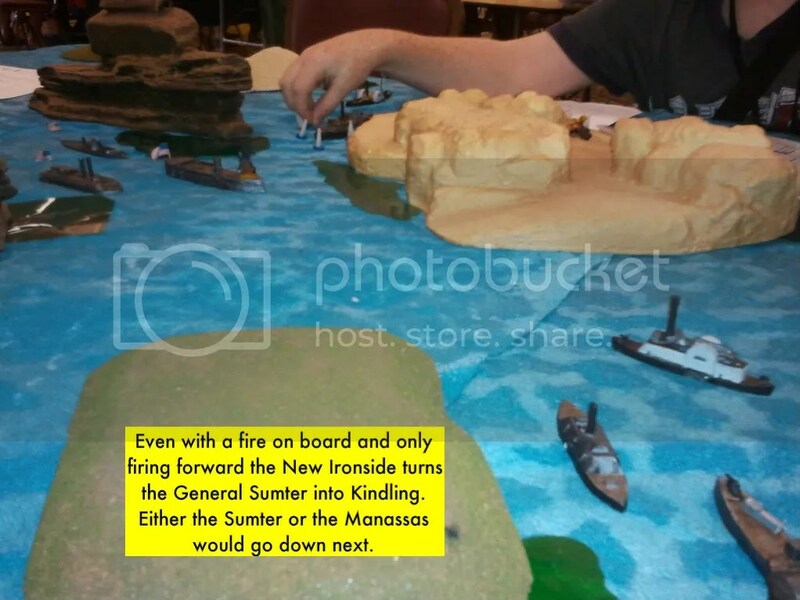 Fire starts on the upper decks of the NEW IRONSIDES (this proves way too easy to put out, basically roll 2-6 on a six sider the next turn). Alas for the BEAUREGARD she is now in position to get a second broadside from NEW IRONSIDES (once she has reloaded a turn) and a fresh one from CAIRO and PASSAIC. A fire storm of shot hits her upper decks, splintering wood, killing hapless sailors, setting fires.. with only a few crew left, the BEAUREGARD drifts forward, her armor dropping from “M” level down to “VL” level. Her captain (probably a replacement) tries to steer her into the channel so she can block oncoming Union ships.. he’s going so slowly the Union easily slips past him, except for the PASSAIC. Even with fires up top, the IRONSIDES and CAIRO slip past the rapidly settling BEAUREGARD, which misses an inadvertent ram from PASSAIC but receives deadly accurate close range fusilades from PASSAIC’s very heavy guns for its pains. The SELMA sees the opportunity, and realizing that it is probably outmatched in broadside weight and armor, decides to dash in to ram the approaching IRONSIDES or CAIRO, it doesn’t matter which. The TUSCALOOSA was just trying to find room to maneuver into a firing position, as it was getting pretty crowded in the channel at that moment. 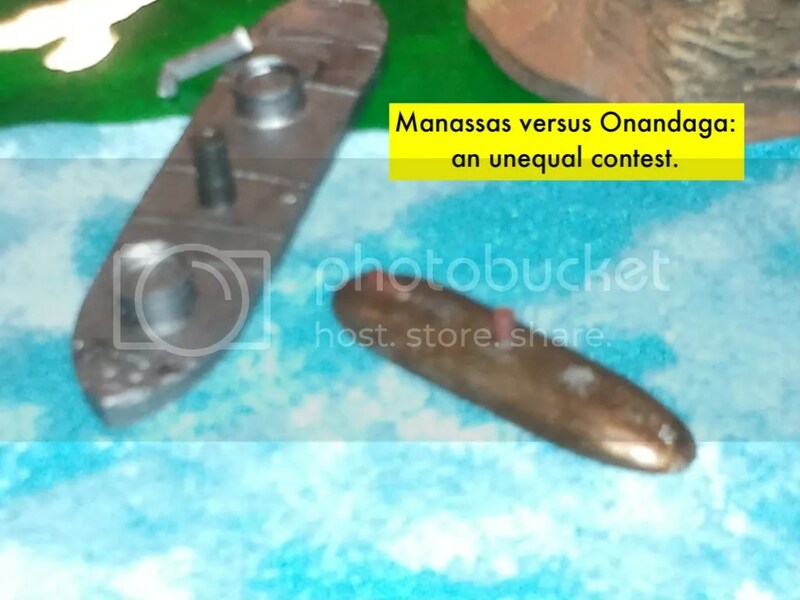 Meanwhile, the ONANDAGA had made it over the bar and the only ship nearby to challenge its advance was the hapless MANASSAS. Talk about a mismatch!! The MANASSAS was shot into a leaky sieve, and had the game continued much later, would certainly have gone down in the shallows. 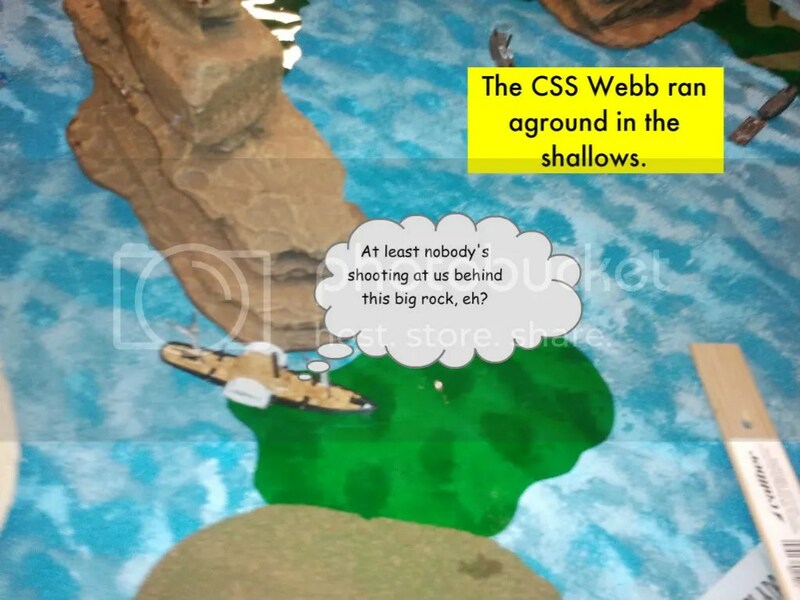 The CSS WEBB, last seen trying to go AROUND the Union navy, gets stuck in the shoals and can’t get off to save her life. So aside from a parting shot from her rear light guns and a little bit of the CAIRO’s broadside unshipping one of her guns, she saw very little action in this fight. 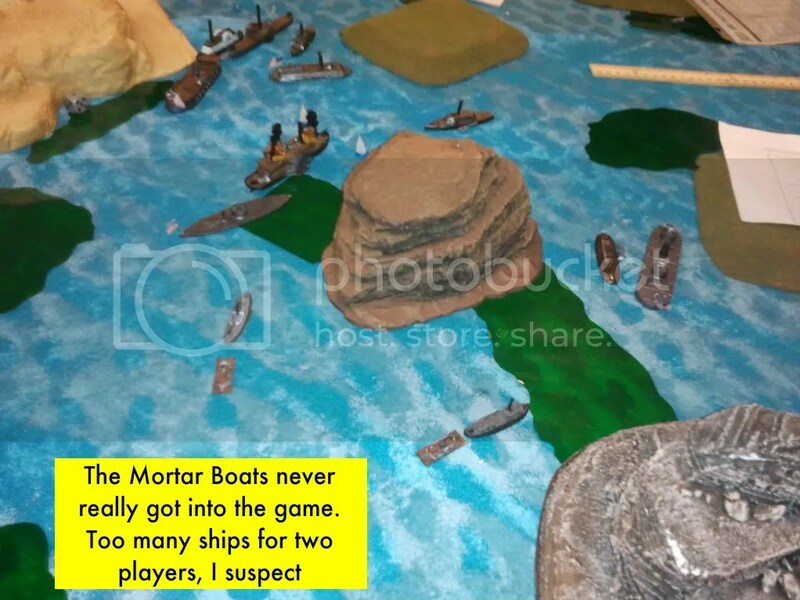 Likewise, the mortar boats (and, parenthetically, the DAVID class Confederate subs) didn’t come into play at all. 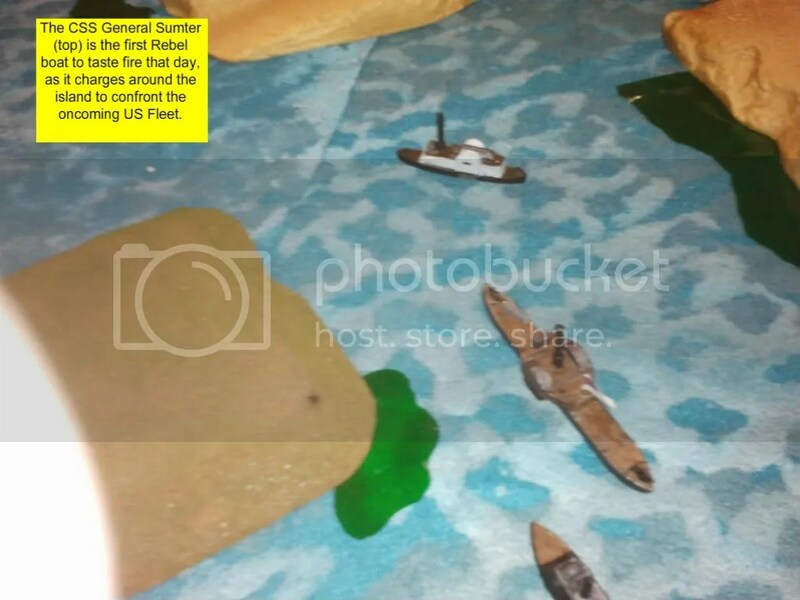 There was too much going on and the tugs were so poorly armed and armored that Garrett didn’t wish to risk them. At this stage, we were running late in the day, it being near 2PM and we had a long drive ahead, so Gar and I made the victory condition sinking ONE Confederate ship (instead of 3, which we started the game with). As the BEAUREGARD was now going down, there were a few last acts to play out… like the ABLEMARLE trying to pull BEAUREGARD’s hash out of the fire unsuccessfully. At this point, the game was officially called by me, as we had to hit the road. 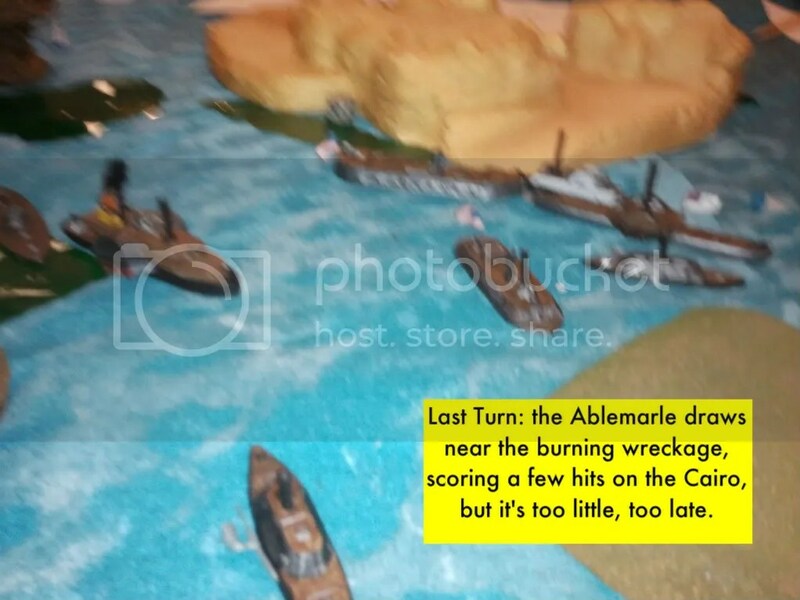 Summary: The Rebs didn’t have a huge chance of victory going into this, much like in real history. However, I would have weighed any actions to delay or block the Union as a victory. Technically speaking, the Rebs did a fine job of blocking and delaying, but got so shot to pieces doing it that there wouldn’t have been much of a fleet in a few more turns. So really, the Union fleet could have bulled its way through eventually. So I’m calling this a Union Minor Victory! 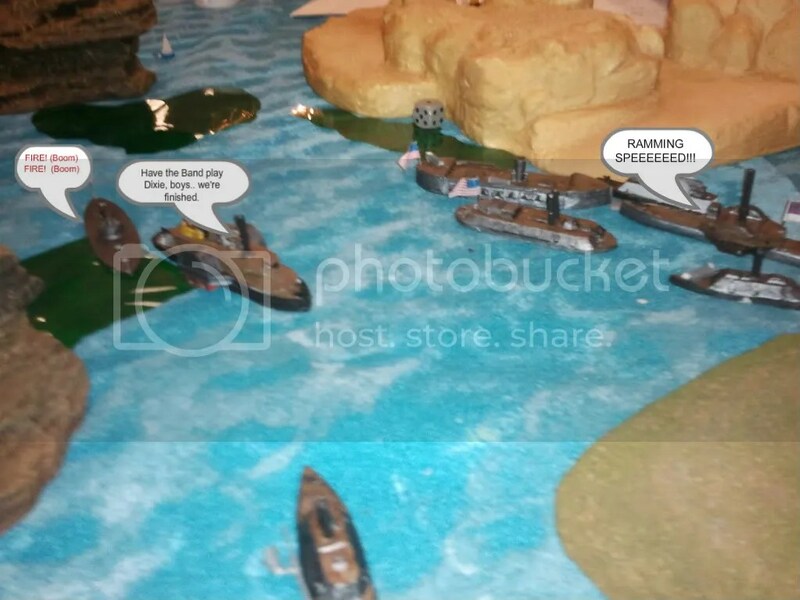 Rules assessment: This was our first time running Beer and Pretzels Ironclads. The concepts were clear and very simple, and mostly resolved with either a 1D6 or 1D20 roll. I had a moment trying to figure out the hit chart, since the typeface is all somewhat uniform and bland, but once I got over that hump the game became simplicity in itself. I would run it again. And so we packed up and headed home, taking alternative routes. We had no difficulty at all on the return trip! I mailed the picture disk yesterday. Hopefully it will get there today. Oh, and if you leave before the sun comes up you get there in no time. I left my place at 5:45 and got there before 8. Left for home that night at 10:50 and got home at 12:45. If 95 is crazy you can also jump over to 17. It runs parallel to 95, and although it has a few traffic lights it is a 55 mph run, and probably has fewer cops that 95, and much less traffic.